The leaves are falling, the air is changing, and autumn is in full swing! It is that time of year where we need to focus on yard cleanup, which then leads to garage organization. With a little help from Sterilite you will have your backyard leaves under control and an efficient storage system in your garage! Raking up leaves in the yard is no small task! This chore is time consuming and needs to be done multiple times throughout the season. It seems as if you can never keep up. By the time the yard is raked and you can actually see your grass, a gust of wind blows and the leaves come falling down again. It is common to use a tarp or a wheelbarrow to transport the leaf piles into the woods. However, a tarp can get heavy while dragging it across the yard and wheelbarrows are expensive and inefficient. 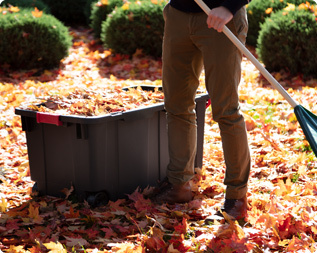 Have you ever considered using a tote for your fall yard cleanup? The Sterilite 40 Gallon Wheeled Industrial Tote is the perfect solution for moving those large piles of leaves. Its rugged design makes it ideal for working in the yard and its large capacity provides you with plenty of space to fill with leaves. This industrial tote features an ergonomic handle for easy pulling while the large wheels and metal axle allow it to roll smoothly even over the rough surfaces in the yard. It is so easy that you can even get the kids to help out with yard cleanup this fall! Now that the yard cleaned up, it is time to direct your attention to the garage. The great thing about our 40 Gallon Wheeled Industrial Tote is that when it is not being used for leaf cleanup, it can be used as a rugged storage solution. Today's busy lifestyles demand storage products that are durable and dependable. This tote is perfect for your larger items such as camping supplies, sporting equipment, and power tools. The robust latches combined with the channeled walls provide added strength for your garage storage needs. 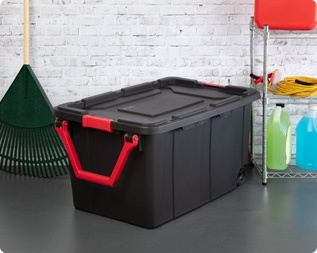 Sterilite's Industrial totes also come in different sizes with a 15 Gallon Industrial Tote and 27 Gallon Industrial Tote allowing you to take advantage of varying spaces in your garage. These totes all stack securely together creating an efficient storage system maximizing the vertical space in your garage. The final step in getting the garage in order is to focus on the clutter of small items that typically get overlooked. It may be small, but it can get out of hand very quickly. If you have a tool bench or work station in your garage, you know how important it is to keep the area clean and organized. This will allow you to be more efficient with your hardware projects. The Sterilite Mini Clip Box is perfect for sorting and storing nails, screws, pushpins, and hooks. 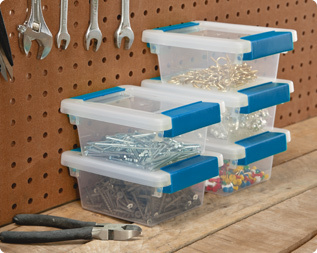 These clip boxes are designed to stack securely on top of each other, freeing up shelf space. The tight clasping latches ensure the small items inside will not fall out even if dropped and the clear containers will make it easy to identify the items stored inside. With the yard clean and a garage organized, it is time to put your feet up and get cozy for the winter! The Sterilite 40 Gallon Wheeled Industrial Tote is the perfect solution for yard cleanup this fall. This rugged storage solution was designed with your lifestyle in mind. 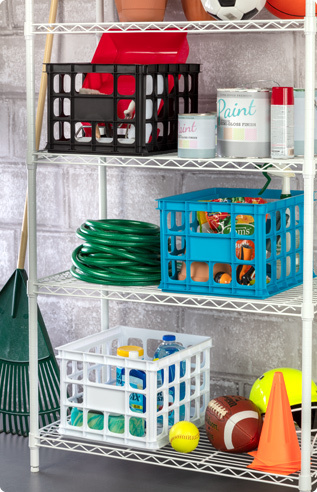 Crate Kits keep the garage organized and make it easy grab and go. Mini Clip Boxes are ideal for sorting and storing small hardware items.